*The child needs help in ALL areas of the assessment. 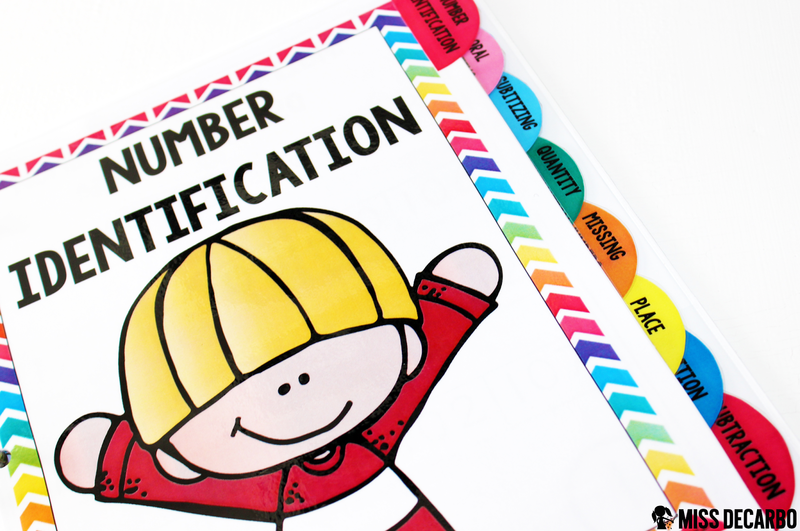 *The child would benefit first from additional instruction in recognizing the greater number in a set. 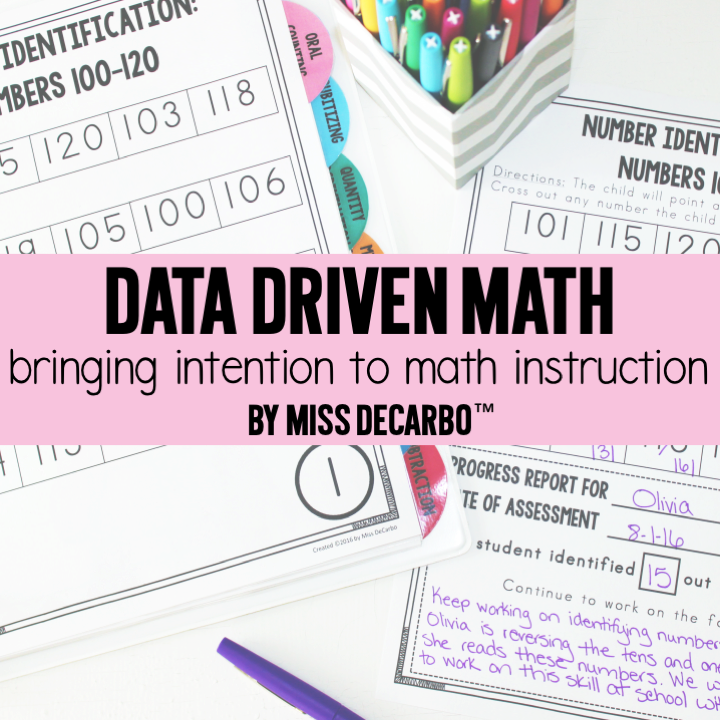 *I don’t have enough specific data and information to make a very STRONG decision in my next instructional moves, because the data I collected is pretty general and there is not a huge weakness in one specific area. 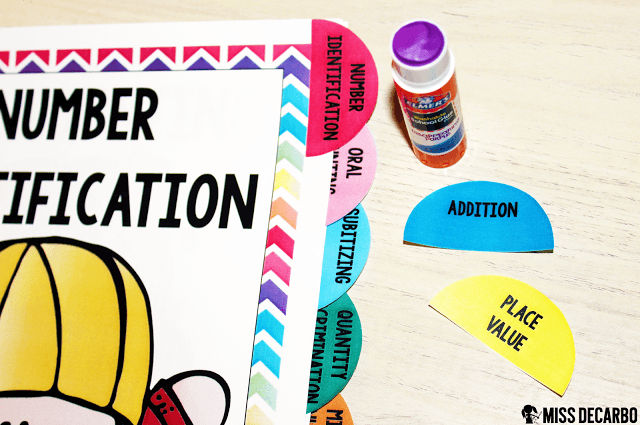 The data problem I described above is how my No Prep Math Assessment Binder came to life! 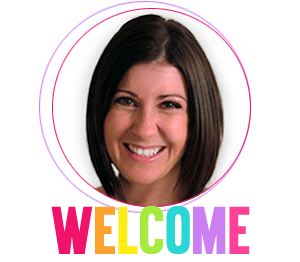 I wanted to create assessments that mirror my ELA Assessments – assessments that are simple to administer, easy for parents to understand, and available right at my fingertips. 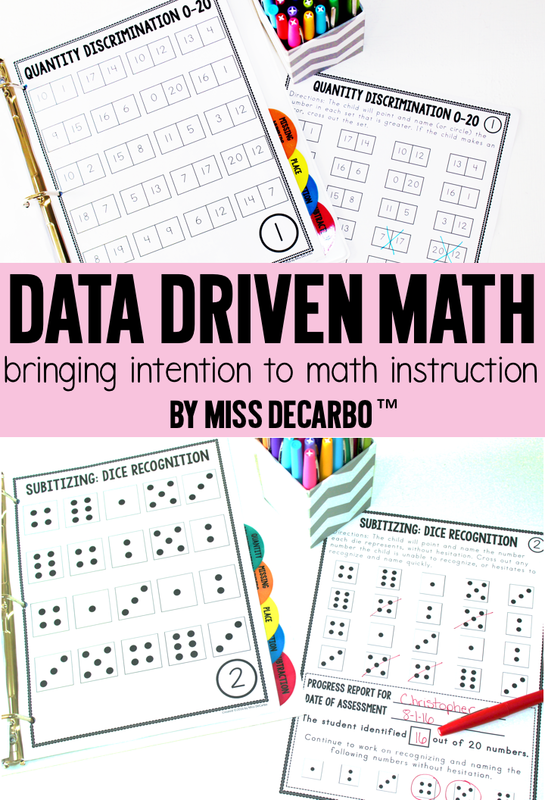 I also wanted editable tracking sheets that would help me to sort and organize my small math groups, and make it easy for me to visually see the instruction and intervention my students were most in need of. Let’s take a little tour! I’ll show you an inside glimpse of the binder, and show you how I determine my “next moves” using this math data. Here we go! It completely correlates with my No Prep Intervention Binder for Math! So, after I identify the area of need my student(s) have, I can simply flip to that same section of my Math Intervention Binder and ta-da! I’ll have intervention resources for that exact skill right at my fingertips. (Cue happy music here.) The binder has easy-to-find tabs so that all of your assessments are organized. You could even use the blank tabs within the binder to add your own district or building assessments, so that ALL of your assessments can be found in the same place. Although you can use regular store-bought tabs to organize your binder, I’ve included my own tabs and a sheet of blank tabs in the PDF, in case you want to make your own. Here’s a quick glimpse of how I did this. I simple glued the tab to each cover page. Then, I laminated the entire cover page for durability, and cut around the tab. How do the assessments work? 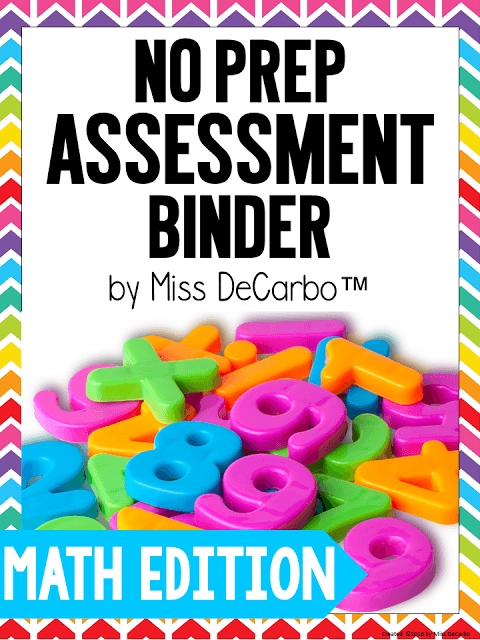 There are THREE assessments per skill within the binder. However, I’ve gone even further and created TONS of variations of each skill, so that you can pull the assessments that work best for your student, small group, or class. 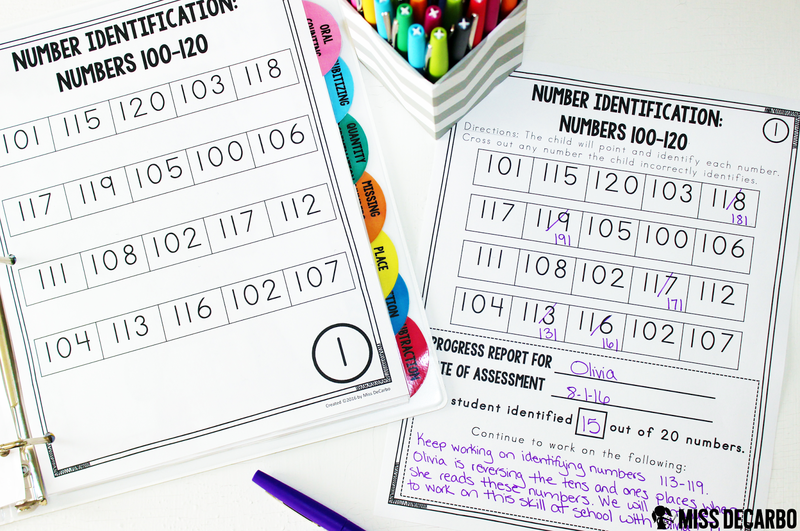 For example, within the Number Identification section are three assessments for Numbers 0-5, three assessments for 0-10, three assessments for 0-20, and so on! 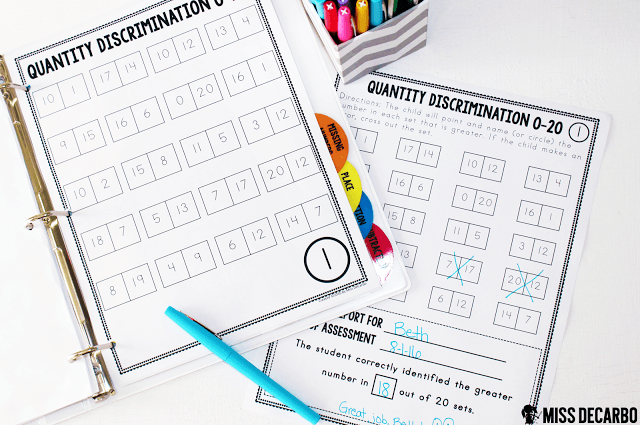 You’ll find assessments for 0-99, 0-120, and 100-120, too! With SO MANY options and variations, this binder is ideal for differentiation, and perfect for intervention specialists who teach multiple grade levels. Some of the assessments work best one-on-one, while the last half of the binder can be a traditional paper and pencil assessment (or one-on-one – you choose!). In the photograph above, I simply flipped to the assessment I needed to give that day in my binder. I placed the binder in front of the child, and I made a copy of the coordinating Progress Report for each child. As the child read off the numbers on the student version, I marked their progress on the Progress Report. You can see in the photo above that I crossed out the numbers the child incorrectly identified, and wrote in what the child actually said for the missed numbers. I filled out the parent half-sheet at the bottom and made a little note about what the child should continue to work on. If you give letter grades or other marks for report cards, there is even space where you can add your own “grade” if you wish. These Progress Reports are prefect for conferences, meetings, data meetings, and your own data records! 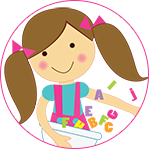 The child can take up to three assessments for the same skill, so you can clearly see if the child is making progress as you provide intervention. It’s THAT easy! What do you do once you’ve collected and graded the assessments for a specific skill? After I have all of my students’ scores on my spreadsheet, the next part is simple. I simply take a highlighter and highlight any students with low scores. As you can see above, I had three students whose scores were significantly lower than the rest of my class. I can quickly scan the sheet and see that these three students will benefit from intervention with quantity discrimination up to 20. 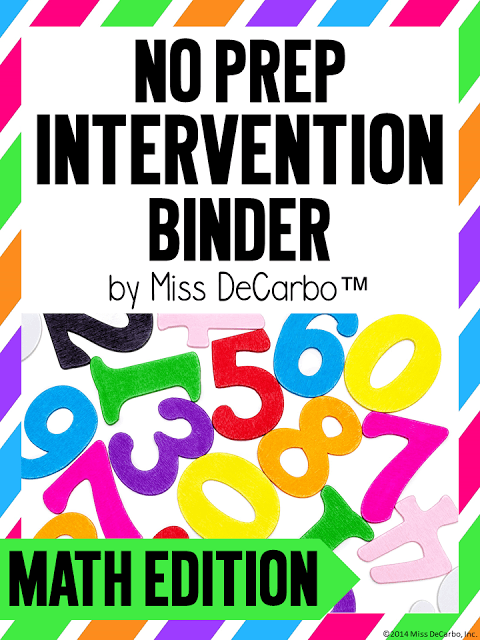 I can use my No Prep Math Intervention Binder to work through the resources that deal with quantity discrimination, or, I can use supplemental and additional intervention for this skill. To help these students, I will pull out place value blocks so that we can “build” the numbers and visually see and count which numbers are greater. 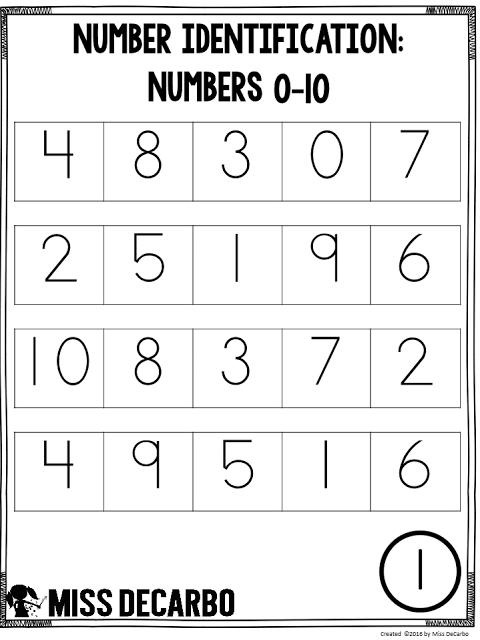 We can also show the numbers on ten frames to see which number within each set is greater. The editable tracking sheets and the easy to administer assessments that are based on a specific skill, allow me to quickly target what it is my students need for math intervention and re-teaching. How do you organize and show data results for ONE specific student? 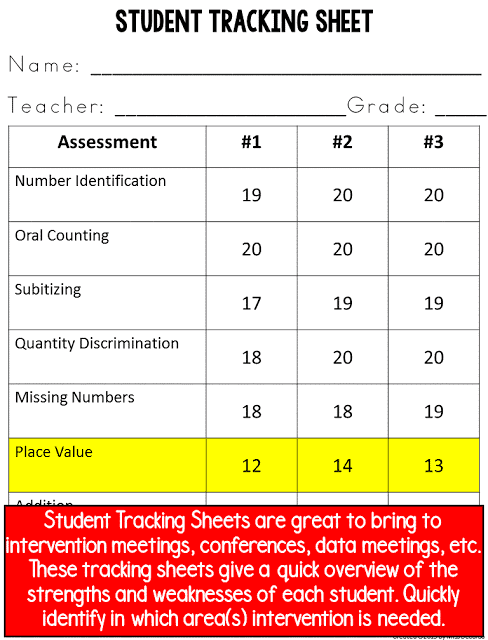 After I list all of the students’ scores on the Student Tracking Sheet, it is clearly evident that the student struggles with Place Value concepts. By highlighting the area the student has received the lowest scores, I know this is an area of need for this child. 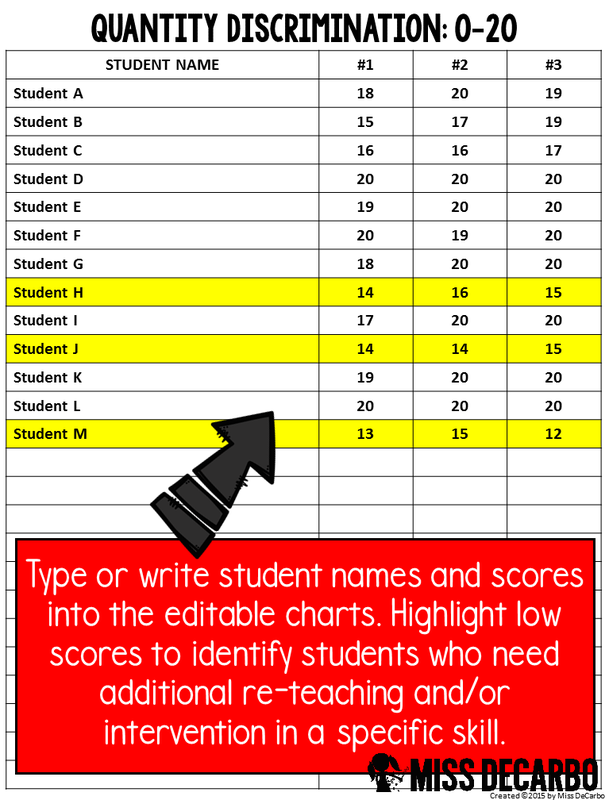 You can not only list the scores from multiple areas on the Student Tracking Sheet, but you could also list, for example, ALL of their place value scores on one spreadsheet. 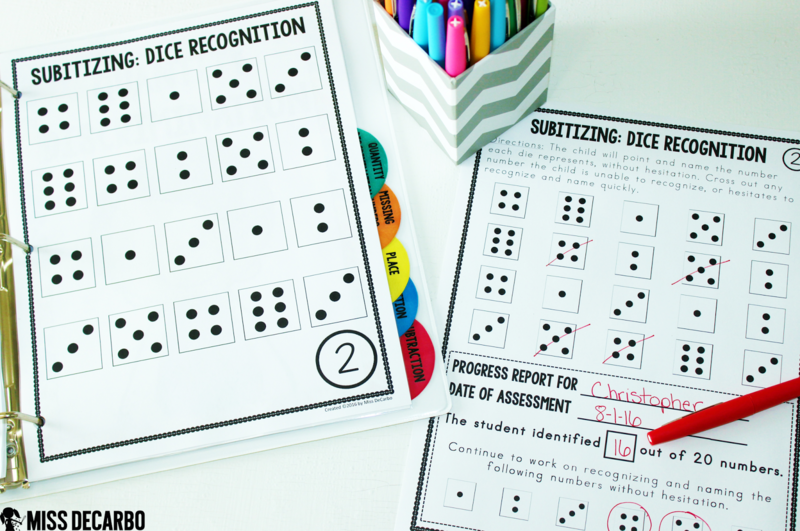 This would tell you if the child struggles with place value understanding up to 10, place value understanding with two digit numbers, etc. You can get REALLY specific in seeing what your students’ needs are to drive your next instructional decisions. Can I try an assessment out for free to see if I like it first? Of course you can! 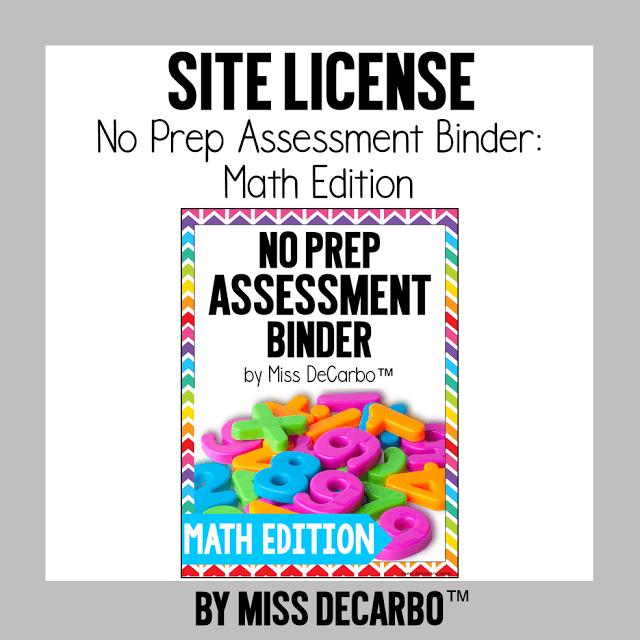 If you click HERE to download the free Preview Download for my No Prep Math Assessment Binder, you will find the following assessment for FREE. 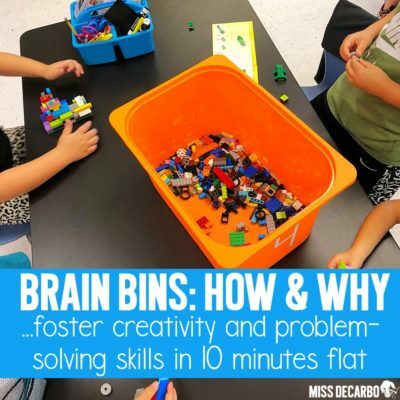 You can print it out and try it out with your student(s). 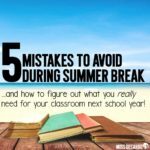 I think you’ll find that the easy to use Progress Report and the simplicity of the student version makes these assessments really wonderful! I have purposely made these assessments “clean and simple.” You won’t find any distracting clip art, fancy fonts, or confusing directions. Just simple, to the point assessments that classroom teachers, intervention specialists, paraprofessionals, and even parent volunteers can easily administer. I hope you’ve enjoyed this little “tour” of my No Prep Math Assessment Binder! 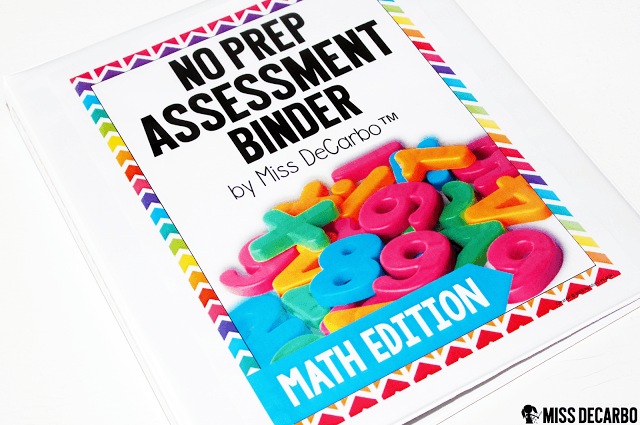 If you already have and use my No Prep Assessment Binder for ELA, I think you will LOVE this one, too! Remember, this is the assessment binder. If you’re looking for the coordinating INTERVENTION binder, you can find that HERE or by clicking on the photo below. 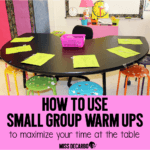 These are fantastic tools for your small groups, data, and intervention times. 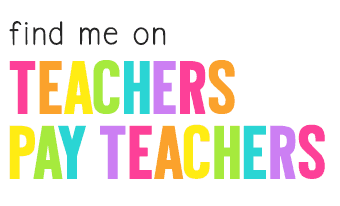 They also work really nicely for volunteers within your classroom. students for a bigger discount than just buying additional licenses. Testing That Is FUN And Child-Friendly?! Hi! How are you doing? 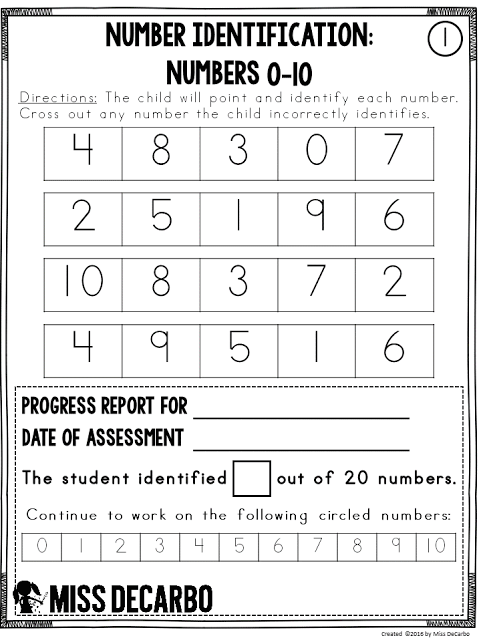 Can I still print the 0-10 assessment Number Identification for FREE? If yes, I will appreciate your response! Hi, Roxie. Yes, you can! 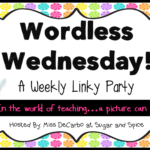 You just click the link in the blog post that takes you to the resource in my store. You’ll find the free assessment in the Preview Download.